Learn The Secrets Behind This Simple, Versatile Offense… For A Balanced Scoring Attack You Can Use Against Man OR Zone! John Wooden, the originator of the 1-3-1, is often thought of as one of the greatest basketball coaches of all-time. His UCLA teams won 10 national championships over a 12 year period, with seven of those coming in a row, even including an unprecedented 88 game win streak. 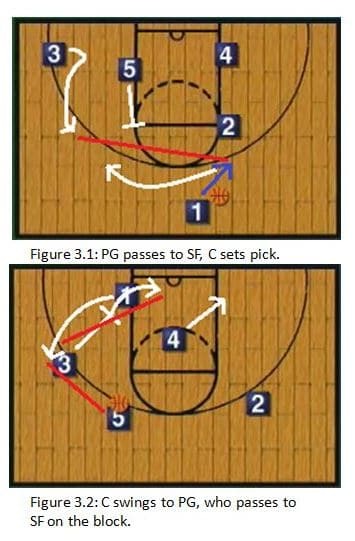 One of the best parts of the 1-3-1 offense is the versatility it provides you with. It allows you to tailor your offensive gameplan from game to game. If you have the size advantage, there are a number of plays to get your big men the ball down low, but if you have a speed advantage, or a number of great outside shooters, the offense can excel as well. The basic formation for the offense places your point guard (1) at the top of the key with the ball, your shooting guard (2) on the right wing, your small forward (3) on the left wing, your power forward (4) on the right block, and your center (5) at the high post. 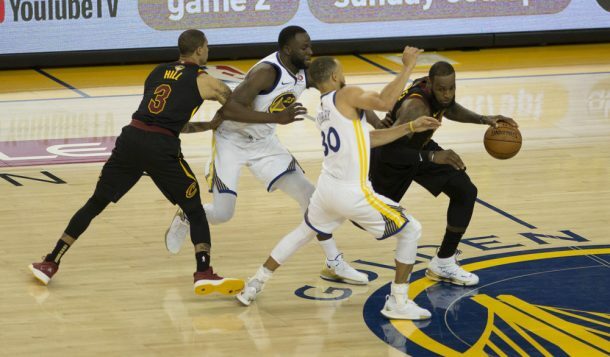 There are a variety of different entries, cuts, and screens to initiate the offense, however, so the players may sometimes start in other positions on the court. 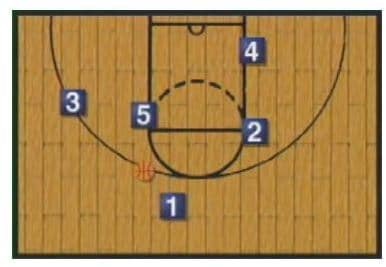 Because of the vast number of options this offense presents you with (all 17 of them are included inside the Unstoppable Half Court Offense playbook) you’ll want to take your time implementing the entire repertoire with your team. Look at which position your team is the strongest, and teach your players those plays first. Below, I’ve described two of my favorite options from the UCLA 1-3-1 set. Each play is described with diagrams and step by step instructions for execution. For all three plays, the legend below explains the diagrams. The point guard will dribble right, taking his man and the defense away from where he wants to go. The small forward fakes a backdoor cut to the basket, v-cutting out to the foul line extended on the wing. The center will creep up to the left elbow, setting up for a screen. The point guard will crossover back to the left side, passing the ball to the small forward. The point guard will continue running left, curling tightly off the center’s backpick. The power forward will pin down his man as close to underneath the hoop as possible. The center will pop out, taking a pass from the small forward. The center will make the high low pass to the power forward, who looks to score immediately down low. 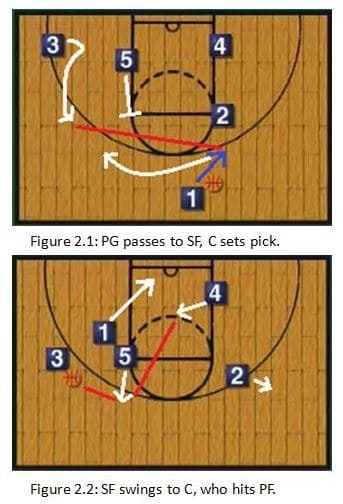 If we can’t make the pass down to the 4-man on the block, the small forward will set a downscreen for the point guard, who will curl back out to the wing, looking for either the jumpshot, or the small forward down low. The small forward fakes a backdoor cut to the basket, popping out to the wing. The small forward will set a downscreen for the point guard, then establish position down low. The center will pass to the point guard, who can shoot or pass to the small forward.